Darren Aronofsky is one of contemporary filmmaking’s true auteurs. A unique and interesting cinematic voice, when it was announced that he would be following up his surprise hit Black Swan with an adaptation of the story of Noah’s ark, a story which had apparently fascinated him since his childhood, there was little doubt we were going to get a film which was unlike any depiction of this story we had seen before. Noah, is an audacious and bold piece of filmmaking, and while uneven it is more ambitious than most films which draw on Biblical stories, which tend to play it safe. 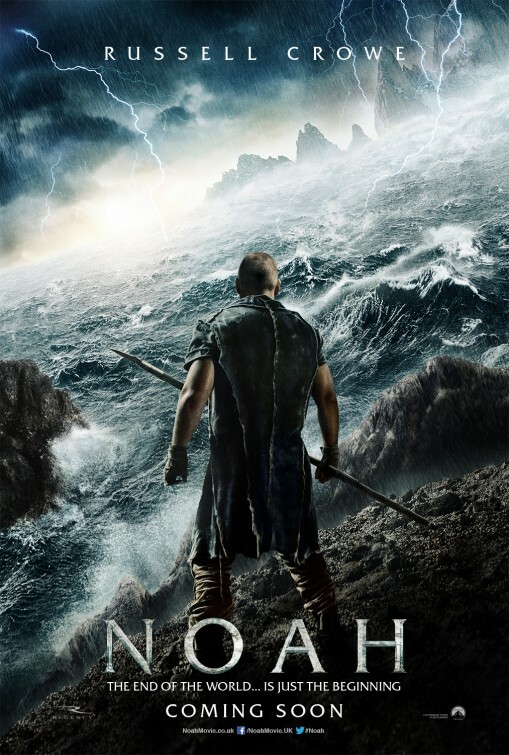 The film presents the story of Noah not as a Biblical history, but rather as a mythology – a pre-historic great flood mythology is part not only of the Judeo-Christian tradition but many of the world’s religions. As such, the film takes on an aesthetic that is more akin to the fantasy genre than the historical epic. This is particularly evident in the depiction of ‘the Watchers,’ Aronofsky’s take on the Nephilim (fallen angels mentioned briefly in the Genesis text), which are shown as giant, Ray Harryhausen-esque rock creatures. As is to be expected, the film has been attacked by some conservative Christian circles for its lack of Biblical accuracy (as is also to be expected, many of its most vocal opponents will openly admit they have not seen the film that has so offended them). They do have a point. At times Noah bears little resemblance to the Genesis account. Aronofsky has himself described the film as “the least biblical biblical film ever made.” But it begs the question whether in this situation biblical accuracy matters? Aronofsky’s film is not at all attempting to make a theological statement. It has no evangelistic agenda. It is neither seeking to persuade nor dissuade its viewers of the truthfulness of the story or the authenticity of the Genesis account. If Noah is evangelistic about anything, it is environmentalism rather than theology. Aronofsky engages with the story of Noah not as a biblical story, but as one of Western society’s foundational narratives. He employs the standard practice of refocusing a well-known story in order to shine a light on a particular relevant issue. Aronofsky’s Noah thus becomes a film about stewardship and dominion. Noah and his family, descendents of Seth, believe humanity is tasked by the Creator – Noah always uses the moniker “the Creator” instead of God, the Lord, etc – to be stewards of creation and they aim to tread lightly on the Earth. “We take only what we need, what we can use,” Noah instructs his children as they pick food from the ground. The rest of humanity, descendents of Cain, whose murder of his brother Abel is depicted by the film as the defining moment of humanity’s corruption, believe the Creator has given them dominion over the Earth and it is theirs to plunder and use. In this film it is as much the way that humanity has treated the creation as it is the way they have treated each other that prompts the Creator to wipe the slate clean and start again. While not a typical epic, Noah is still an impressive visual experience. The film carefully combines computer generated material with some impressive sets. The ark itself is an imposing structure – a monolithic, wooden box nothing like the traditional boat shape usually represented. All of the film’s animals are computer generated, which isn’t as bad as it sounds. Aronofsky also employs some interesting and arresting aesthetic devices. Noah recounts the creation story to his family, and his words are accompanied with a flickering time-lapse imagery, which is very effective. Russell Crowe is strong in the title role as a character who is supposed to challenge us. On the one hand, we see him as an honourable figure, one who protects his family in a hostile world and seeks to live a righteous life. He sees a vision from the Creator and he is obedient. Yet as we sit inside the ark with Noah and his family and hear the cries for mercy from those on the outside as the floodwaters rise, we wrestle with Noah’s complicity in this genocide. Then when he comes to doubt the vision he has seen, and question whether it is indeed his family’s responsibility to repopulate the Earth or whether they are simply to shepherd the animals through this period and then themselves die off, he becomes quite a threatening figure to his wife and children, and Crowe is able to convincingly move from powerful guardian to threat. It is a controversial but very interesting characterisation. Noah has its problems, it is a bit uneven and at times its environmental agenda is overplayed, but you will struggle to find a bolder, more ambitious and thought provoking blockbuster. Solid review! I’m very interested in seeing this film now. Glad to her Crowe did well in this role.